I've been trying to figure out *how* to write this post without it sounding like an infomercial... so, I'm just going to start (and also add the "fine print" that I'm in noooooooo way being paid for this post, but do want to - as always - share what works for our family!). Our family hasn't been on a "real" vacation ever. A few times since my hubby returned from his last deployment we've driven - in the middle of the night to avoid as much traffic as possible - seven hours to visit friends whom my dear hero has literally known since he was three years old. That's been the extent of our family vacations and all that our 7 year old daughter has ever known. About two years ago, as different school friends started talking about their wondrous, magical, exciting visits to Disney World (we live in the southeast... it's sort of a rite of passage for many kiddos in our area), our sweet girl started a campaign to secure her own visit to this amazing place. She drew pictures, talked incessantly about the adventures her friends told her about, pointed out every single Mickey, Minney, or other Disney character she saw ANYWHERE. (I can't imagine where she gets her persistent nature... caaaaaan't imagine ;) ). So, when the friends mentioned above (that my hubby has known forever) started planning a trip to Disney - and she overheard a conversation / debate about whether or not it would be possible for us to join them - the deal was done. All bets were off. (And mommy... she caved... she just couldn't help it :) ). I'm going to stop here and say that planning a trip to DISNEY WORLD when our family lives day in and day out with severe Post Traumatic Stress Disorder and all the lovely challenges of Traumatic Brain Injury, sounded pretty insane. My dear hubby gets physically ill when we get more than 30 minutes from home. Our days are very planned, as predictable as possible, and new "adventures" are sooooooooo not welcomed. The triggers they bring are just so costly - seriously the recovery from those moments can take our family weeks or months before things start to calm down. And so, he caved (barely). 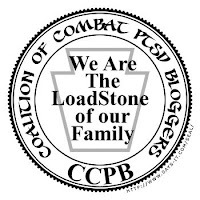 So, of course, I went into PTSD/TBI Caregiver hyperdrive. Trying to anticipate every single potential issue - every possible "fix" or idea to make the trip easier - and the lists... ohhhhh my, the lists. Then, about 10 days before the trip our family car (the only currently fully running vehicle, an almost 12 year old Santa Fe with way too many miles) started throwing unexpected fits (it's normally reasonably well behaved!). It lived at the mechanic for a few days... came home two days... and then went back for a visit. And the hubby, the hubby was nervous. (and admittedly, so was I). What would happen if we got 8 hours from home, the Santa Fe decided it missed the mechanic, and it went on strike again? I could just imagine the full PTSD/TBI meltdown as we sat on the side of the road in some unknown / unfamiliar location. And, I also saw tell-tale signs that our vacation (even after all my extensive begging) was about to be a no-go. The answer? An extensive search for a rental car coupon... a really good one... and while I was at it I decided that since a "crossover" SUV was $26 more for the week but offered much more room and potentially a more comfortable ride for the hubby, that we would choose that. I had *NO* idea what a great choice that was. But, now I'm going to tell you... because after all, sharing "intell" about how to cope with PTSD, TBI, and all their "stuff" is what we do here :). First, even on short drives, the hubby (with his extreme heat sensitivity issues thanks to TBI and Iraq) and the child (with her Sensory Processing Disorder issues which mean she can't *stand* to be cold / chilled / or think she might possibly be) always end up in a huge fuss about the thermostat. Never fails. Complete meltdown (and the resulting need for creative intervention on my end). The Acadia has *THREE* different climate controls. Taaaadaaaaa, everyone (even me!) can choose their own perfect setting. Speaking of having a third row - never, ever imagined how handy that would be! The following is our "normal" scenario (even on short 20-25 minute rides): Our daughter *LOVES* to talk and because of the auditory part of her Sensory Processing Disorder (SPD), often talks *REALLLLLLY* loud. The hubby (refer above, often has a hard time leaving the house at all, so once he's in the car is in PTSD/TBI overload mode) very quickly looses patience with the noise. I'm then in the middle of the two of them trying my best to facilitate some sort of peace treaty. So, instead, we always enter the vehicle with multiple, fully charged electronic devices (yes, I know... boooooo electronics... but it's about survival...) and make sure the kiddo has lots of games to choose from (I do try to make sure they're educational!). This scenario helps prevent full out war - but again since our daughter has SPD, the volume on the games is always LOUD - granted, not as loud as her talking, but still loud. So, the hubby also has a limited "I can deal with this" period for that... and it's CERTAINLY not long enough for us to drive to Disney. *BUT* third row magic saved the day! The kiddo, in her third row kingdom, was far enough away from her dad's ears that the game noise didn't bug him! SERIOUSLY, *MAGIC*. Some other really helpful features - the XM Radio (the hubby gets really aggravated while trying to find music he likes when stations are changing and quickly bores of the music he has... problem solved), the dimmable panel lights (TBI light sensitivity is usually as issue with LOTS of vehicles, but not this one), HUGE glove compartment (convenient storage for medications, TENS unit, etc, we needed during the trip), and soooooo much more. So, what's the point of this post? My point (while, obviously, my choice would soooooo be the Acadia!) is to think through what you'll be driving / riding in on a long vacation. 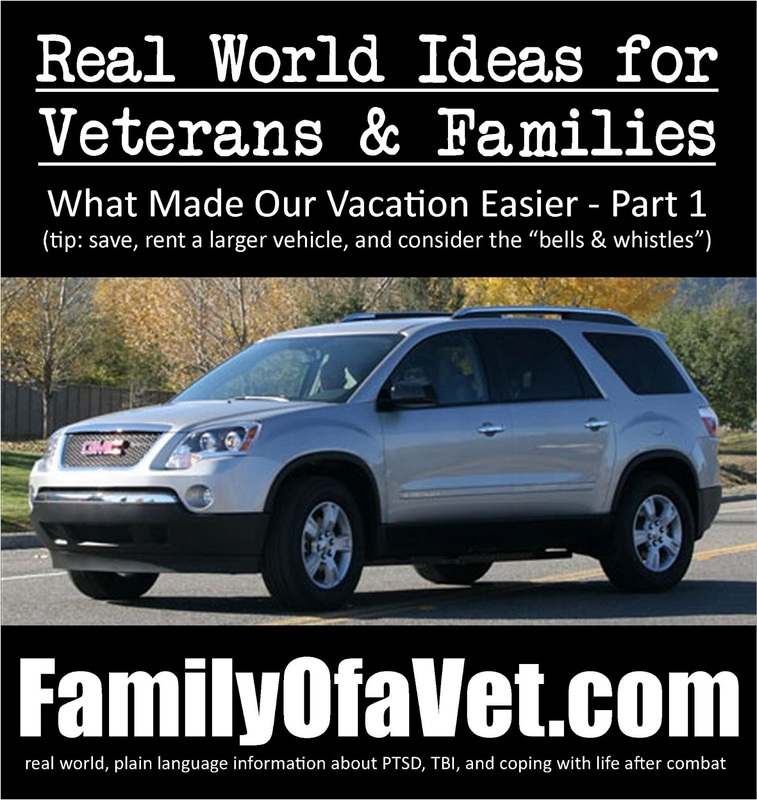 I know for many of us budgets are TIGHT, but the reduced stress, reduced triggers, reduced arguments, increased comfort which helps with pain management (which, as we all know, pain only exacerbates PTSD and TBI symptoms), increased convenience, etc, are reallllllllly helpful if you can squeeze a rental car into your trip budget. I actually finally found the best deal on a website I hadn't used before - CarTrawler.com (the link came up after I booked our hotel... and right before I booked the rental through a different site, but this one was almost $80 less!). But, whatever site / rental method you're going to use, spend some time looking for deals, looking at how renting in different locations impacts the price, etc. I know it's an "extra" to-do on our often verrrrrry long lists, but that time can save you a chunk of $. Our final rental price - for the entire week of waaaaaay reduced stress and added comfort - was $236.98 (which averages to $33.85/day). Honestly, probably the best $236.98 I've ever spent. And, I will add this is the third time we've rented in the last few years (like I said, we don't travel... so rentals are generally only done when our Santa Fe is in the shop) from Enterprise. It helps that they can "pick us up" if we're renting from a nearby location, that having two drivers (husband and wife) doesn't add an extra charge (so, if the hubby wants to drive / can drive, we're covered), and we've always had great customer service. Also, if you're a member of Veterans Advantage, they offer a discount for Enterprise (though this time I found a better price on CarTrawler as mentioned above). Now you have it... my first "what made our trip easier" tidbit. :) Two more to come (#1 - preparing / thinking about the "best case scenario" for hotel arrangements and, #2 - things you may not have thought about or known about when visiting "tourist attractions" with PTSD and TBI) so keep an eye out! I'm going to try my best to get them done this week!! 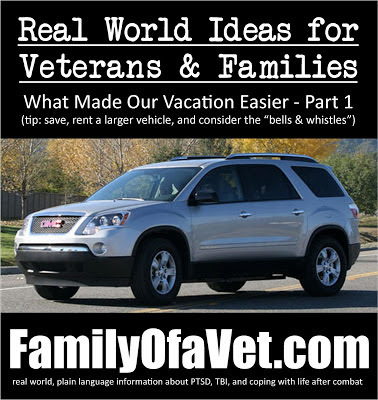 Hope this is helpful :) If you have your own "ways we make/made our trip easier" tips to share, please e-mail them to me this week (brannan-at-familyofavet.com). I would *LOVE* to do a post with feedback from others - we can all use help brainstorming this kind of thing!